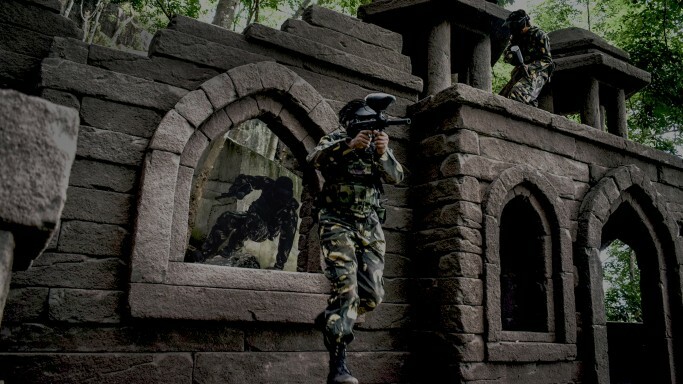 The first major BOT tourism in Kerala, India Jatayu Earths Center is the first joint effort by the Tourism department of Kerala and Mr Rajiv Anchal along with private equity holders to create a destination, which is a unique combination of all aspects of tourism and offers a complete Kerala, God’s own Country experience to every tourist. The concept is the brain child of renowned film director, art director and sculptor Mr Rajiv Anchal and his team took ten years to meticulously design and complete this monumental project. Guruchandrika Builders and PropertyPvt.Ltd. 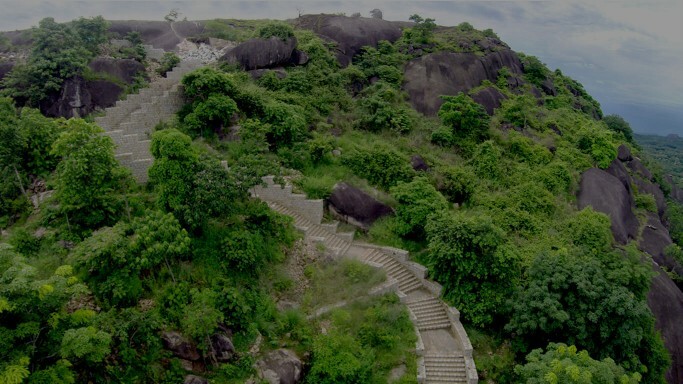 have leased the government owned land for 30 years to build and operate Jatayu Earth’s Center. Jatayu Earths Center tourism project is spread over 65 acres of multi terrain landscape at Jatayupara near Chadayamangalam town in Kollam district of Kerala. 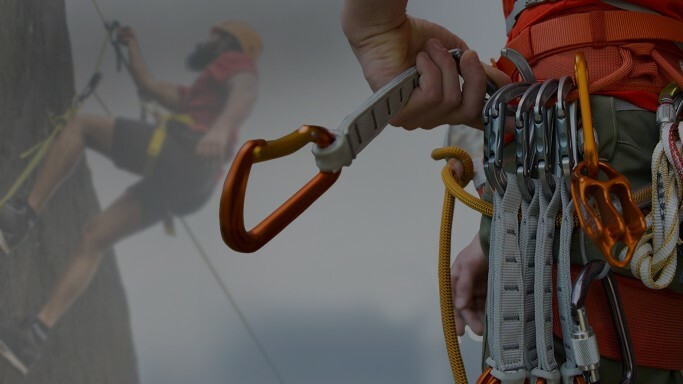 The terrain is 1000 feet above sea level and has diverse geographic features ranging from hills,valleys,rugged rocks, caves to cultivable lands. The destination is right at the epic center of the south Kerala tourist spots and is easily accessible,since it is only 500 meters away from the Main Central(MC) road. The nearest international airport,Trivandrum, is only 50 kms away from Jatayu Earths Center.. 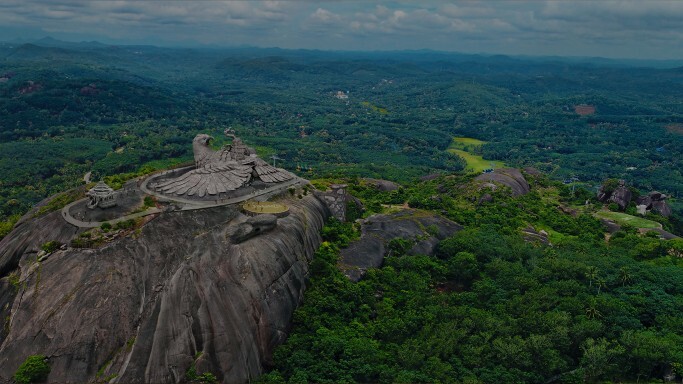 The giant concrete statue of Jatayu is built on a mighty rock named Jatayupara (para means rock in Malayalam). The colossal statue is 200 feet long,150 feet wide and 70 feet making is the largest functional bird sculpture in the world with an enter into the Guinness Book of World Records. Jatayu Earths Center is a glorious example of sustainable and eco-friendly tourism in India. 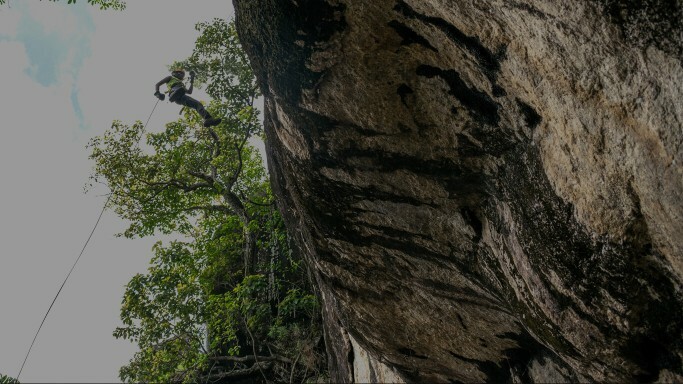 The hills, valleys,caves and vegetation spread across 65 acres remain almost unaffected even though a crowd-pulling tourist destination is built right there. 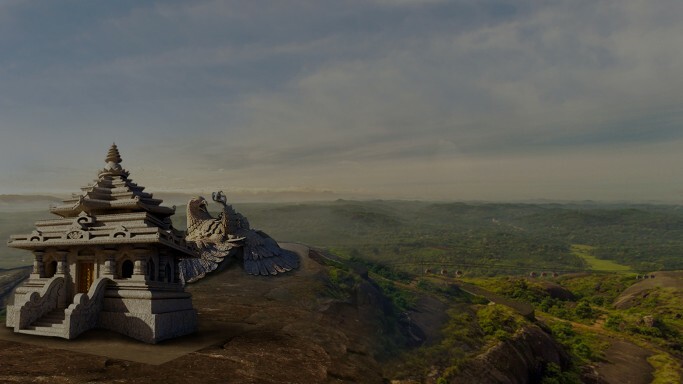 Moreover Jatayu sculpture stands as a guardian to the hills and rocks by protecting them from mining. Hence the name Jatayu Earths Center is most appropriate for this project. One of the biggest challengers for the project was the uninterrupted availability of water source. After thorough analysis of the landscape, a check dam was constructed between two rock valleys with a capacity of twenty lakhs liters for water conservation.The water scarcity issue was thus solved by collecting and storing rainwater and using it throughout the year. The ready availability of water enriched the flora of the place. The electricity required for the smooth functioning of the Jatayu Earths Center is domestically harnessed from solar power. A planned agricultural society is formed to promote organic farming in the adjoining cultivable lands. Special stalls will be set up at the Earths Center for visitors to buy fresh products from those farms. 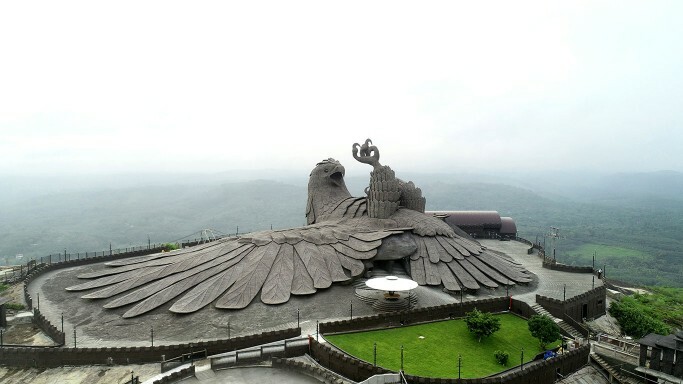 Thus Jatayu Earth’s Center is conceptualized and implemented with environmental protection and ecological equilibrium. In the great epic Ramayana, Jatayu is characterized as a noble bird of divine origin. One day he happened to hear the plaintive cry of a lady. It was Sitha lamenting for help while she has being abducted to Lanka by the demon king Ravana. Jatayu rushed to her rescue, stopped Ravana’s chariot named Pushpaka Vimana and engaged in a battle with him. Eventually, Ravana took his powerful sword Chandrahasa, cut off the bird’s left wing and went away with Sitha. It is said that the injured Jatayu and his lost wing landed on top of a rock. In time, the rock got the name Jatayupara. This is where the monumental statue of Jatayu is now built. There is a pond near the rock which is said to be formed by the stroke of Jatayu’s beak. It has water throughout the year and never goes dry. Legend also says that Lord Rama later came to Jatayupara and gave moksha or deliverance to the wounded and dying Jatayu. The good bird told the whole story and Rama got the vital information about his wife Sitha. There is a mark of footprint said to be that of Lord Rama. A temple dedicated to him can be experienced in an adjacent compound. 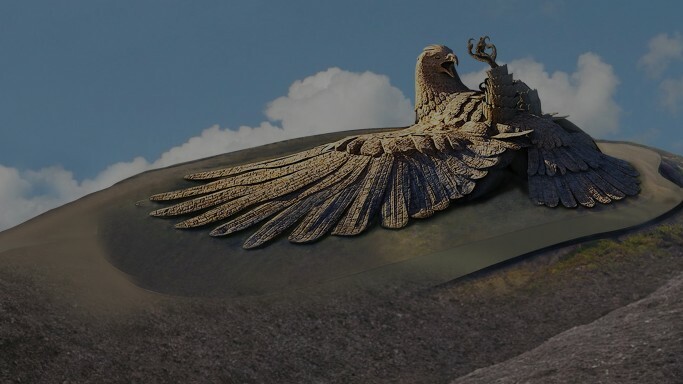 Jatayu is an embodiment of valor and chivalry. Risking his life, he tried his best to save sitha from her abductor. 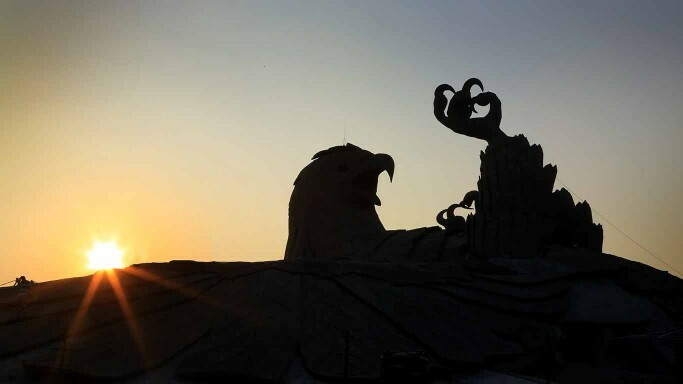 Hence the Jatayu sculpture uprights as a towering tribute to women’s safety and honour. Jatayu also represents a bygone era when humans, animals, birds and other living forms cared for each other and fellow begins and lived peacefully on this Earth. In the words of Mr Rajiv Anchal, this symbolism has great relevance in today’s social scenario since the crime rate against women is on a high. Each guest at Jatayu Earths Center is requested to understand and emulate the inner meaning of this inspiring creation.